Should councils charge for the green waste removal service? To bin or not to bin? That is the question across the county as residents grapple with the green charges postcode lottery. For very soon where you live in Lancashire will dictate whether you will have to pay to have your garden waste taken away by your local council. Preston, Wyre and Lancaster councils are set to introduce a £30 annual charges for collecting the compostable waste in 2016/17. But elsewhere in the county, from Chorley and Fylde to South Ribble and Hyndburn, the district council collections will continue as usual, with residents able to put out their garden waste for collection and recycling for free. The charges are being introduced against a background of widespread cuts to funding for local and county government. But - and this is a question set to vex Council Tax payers - Preston, Lancaster and Wyre have decided to start charging for green waste removal as a cost cutting measure ahead of the withdrawal of county council funding in 2018 for its share of the recycling service. He added that the council had been shocked to learn that following the autumn settlement it would have to make an extra £4m of cuts by 2020. Preston Council will introduce its charge on July 4. In Lancaster, where the council will introduce its charge in August, councillors say the charge will bring in £870,000 in a year. But he admitted the council may have to look at charging in the future, particularly in 2018 when the county council cuts bite. 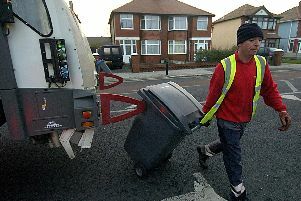 IA spokesman for Lancashire County Council said: “In the early days of recycling when district councils were introducing doorstep collections and we were trying to encourage more recycling we agreed to help them by sharing the cost of bringing in the new collections. The agreement, under which the county council still pays around £10m a year to district councils, was originally made for 10 years and was extended in 2014 for a further 4 years until 2018. Those who choose not to subscribe to the charged for service will have to deal with their garden waste in other ways with councils urging them to consider composting. •In another change the County Council is stopping processing housesholder’s food waste. This will mean that foodwaste can no longer be placed in green waste bins from April. * In Ribble Valley not only will the service be free, you can also apply for a bigger green waste bin. * Your green waste bin could be brown,green or black with a green lid. Bin colours vary from council to council.